U.S President Barack Obama makes a statement at the COP21, United Nations Climate Change Conference, in Le Bourget, outside Paris, Nov. 30, 2015. U.S. President Barack Obama urged world leaders to "rise to this moment" Monday, telling them their progress at a U.N. climate summit in Paris will be measured by "the suffering that is averted and a planet that is preserved." Obama said the nations of the leaders in attendance share a sense of urgency about their goal of curbing fossil fuel emissions and limiting the rise in global temperatures, and cited some progress the United States and others have already made. "Our task here in Paris is to turn these achievements into an enduring framework for human progress," he said. "Not a stopgap solution, but a longterm strategy that gives the world confidence in a low carbon future." He called on the delegations to agree to a system that is transparent and gives them confidence everyone else is meeting their commitments. He also highlighted the need to provide resources to developing nations in order to help them use clean sources of energy. "Let's get to work," Obama said in closing. The leaders are working to agree on binding measures to keep global temperatures from rising more than 2 degrees Celsius above pre-Industrial Revolution levels. The U.N. weather agency says the average global temperature is set to rise by 1 degree Celsius, halfway to the limit the U.N. is seeking to impose in order to prevent potentially catastrophic global effects. 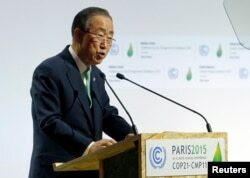 United Nations Secretary General Ban Ki-moon delivers a speech for the opening day of the World Climate Change Conference 2015 (COP21) at Le Bourget, near Paris, France, Nov. 30, 2015. U.N. Secretary-General Ban Ki-moon said the summit "must mark a decisive turning point" and that the leaders "have the power to secure the wellbeing of this and succeeding generations." "You are here today to write the script for a new future, a future of hope and promise of increased prosperity, security and dignity for all," Ban said. "We need the world to know that we are headed to a low-emissions, climate resilient future and there is no going back." French President Francois Hollande has warned of obstacles for the 195-nation summit in reaching a compulsory deal in Paris, including the legality of any accord, financing for poorer countries and monitoring of countries' pledges to limit greenhouse gas emissions. So far this year, 183 nations have issued long-term plans to cope with climate change, but difficult negotiations are expected at the summit and related international meetings that run through December 11. An attempt in Copenhagen in 2009 to craft a global deal foundered at an ill-tempered summit, with divisions between rich and poor countries. 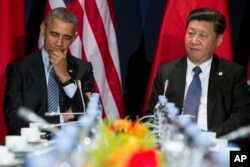 U.S. President Barack Obama, left, meets with Chinese President Xi Jinping during their meeting held on the sidelines of the COP21, United Nations Climate Change Conference, in Le Bourget, outside Paris, Nov. 30, 2015. Before the summit opened, U.S. President Barack Obama met with Chinese President Xi Jinping and said the two countries have a common vision of what is needed in an agreement, including steps toward a low carbon global economy and helping financial support to help developing nations adapt. "As the two largest economies in the world and the two largest carbon emitters, we have both determined that it is our responsibility to take action, and since our historic joint announcement of our post-2020 climate targets in Beijing last year, more than 180 countries have followed in announcing their own targets," Obama said. "So our leadership on this issue has been absolutely vital." The U.S. has pledged to cut emissions up to 28 percent by 2025, while China said targets to peak its emissions by about 2030. Obama also held separate talks Monday with India's Prime Minister Narendra Modi. Together, the U.S., China and India account for about half of the world's emissions of carbon dioxide, a gas that traps heat in the atmosphere and that scientists have identified as a leading cause of the rising global temperatures. France says about 2,800 police and soldiers are securing the Le Bourget conference site, and 6,300 others will deploy in Paris. French Interior Minister Bernard Cazeneuve said nearly 1,000 people believed to pose security risks have been denied entry into France. Ahead of the Paris summit, hundreds of thousands of protesters joined worldwide demonstrations Sunday calling for adoption of global environmental control. Activists linked hands in the heart of the French capital amid tight security, in the wake of the deadly Islamic State terrorist attacks earlier this month that killed 130 people. 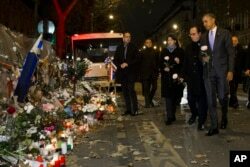 President Barack Obama, right, French President Francois Hollande, second from right, and Paris Mayor Anne Hidalgo arrive at the Bataclan, site of one of the Paris terrorists attacks, to pay their respects to the victims, Nov. 30, 2015. Less than an hour after arriving in Paris, President Obama made an unannounced stop outside the Bataclan theater, laying a rose at a makeshift memorial for the 90 people gunned down during a concert on November 13. Later on Monday, during his remarks at the climate summit, Obama said the world stands united in solidarity with the French capital. “We salute people of Paris for insisting this crucial conference go on. An act of defiance that proves nothing will deter us from building the future we want for our children,” Obama said.